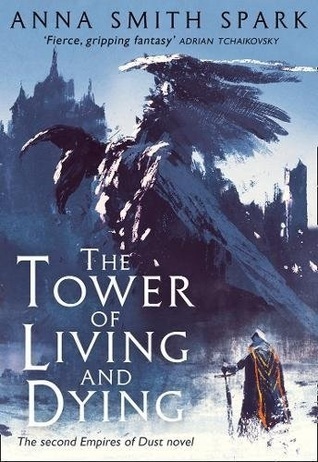 First off, big shoutout to Hachette Audio, the author, Colin Mace, and Meriel Rosenkranz for an ALC (advanced listening copy) of The Tower of Living and Dying in exchange for an honest review. Receiving this ALC in no way influences my thoughts or opinions on the novel. 1) The Court of Broken Knives (Empires of Dust #1) was one of THE most underrated books of 2017, IMHO. Had Kings of the Wyld by Nicholas Eames not come out last year, it would’ve been my #1 read of 2017. 2) Colin Mace is quickly becoming one of the best narrators OF ALL TIME. Anything tied to his name, I’ll listen to. Simple as that. He does grimdark like no other. Highly suggest you check out this series, on top of Ed McDonald’s Raven’s Mark series and James Bennett’s Ben Garston novels if you like audiobooks. King Marith. Demon. Murderer. Death itself. Queen Thalia. Former Priestess. Wife. Betrayer. Both come to embrace the power bestowed upon them and march to reclaim the throne owed. Marith continues to gather followers in order to bulk up his ranks, killing any who do not worship at his feet. 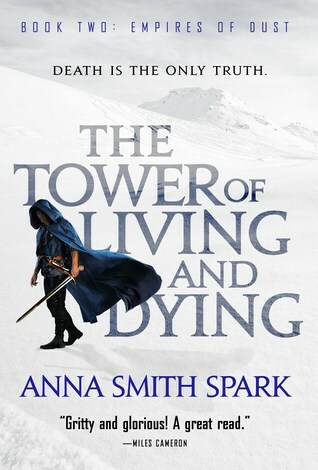 Thalia attempts to bring Marith to the light, believing there is still some good in him, but can slowly see the darkness quenching the light. The city of Sorlost, once legendary, beautiful, and unconquered, a city where its inhabitants pissed gold and jewels, attempts to recover. Orhan leads the effort, but his past comes back to haunt him as his misdeeds have begun to spread like wildfire. Spark has a unique voice, one that I believe is better listened to than read. The pace at which her writing comes off of the pages can be a turn off to some, but adds to the overall grittiness of the story she is portraying. The descriptive info dumps during battles, where certain words are often repeated two or more times, hammer home the intensity of war, the gruesomeness of death, and the scene uncovered by the flames of dragon’s breath. While not as hard hitting as its predecessor, TToLaD continues to show off Spark’s poetic and gorgeous prose, which is like a fine wine mixed with barbed wire and rusty saws. It is a story in which I will continue to look back upon, even after its finale, because of the richness of spoken word is eludes. I always think that I have heard and seen it all, the ways in which a man can be killed and the act described, but then Spark throws me a curveball. I, for one, cannot wait until the next installment. 2018 is continuing the trend that started in 2017 with fantastic fantasy debuts by giving us exactly what we asked for in their sequels, and Orbit is leading the charge with gusto. I love my paperbacks, but there are just some narrators that I can’t do without. Colin Mace, Joe Jameson, and John Banks are always going to take precident.